The first case of prostate cancer was described in 1853 by Doctor J. Adams at The London Hospital. After 165 years and even though significant advances have been made over the last decades in the fields of screening, detection, and treatment, prostate cancer is still a serious health hazard for men worldwide., In the United States, it has become the most diagnosed cancer in men and the second cause of cancer-related deaths with worldwide statistics showing a similar image, being the second in diagnosis and fifth in cancer-associated deaths in men. For the last 70 years, androgen depletion has been the first line of treatment for advanced-stage prostate cancer. Although many patients initially respond well to the therapy, eventually all patients will, in time, relapse and die of a recurrent androgen-independent form of the disease, commonly known as castration-resistant prostate cancer (or CRPC). The standard treatment for men at CRPC stage is chemotherapy, mainly with docetaxel, which was the first drug to show results in extending the survival of these patients. This therapy has become more important since 2015 when new studies showed that patients starting with androgen deprivation therapy had a better survival rate if they combined it with docetaxel. However, all patients treated with this drug will present, in time, a progression of the disease due to existing or acquired resistance to the treatment, making the understanding of the mechanisms of this resilience a highly important health issue. Docetaxel is an antimitotic drug that binds to the β subunit of tubulin in microtubules stabilizing them, leading to mitotic arrest and subsequent cell death by apoptosis. At present, there are several mechanisms described for docetaxel resistance. Upregulation of efflux pump proteins limits the intracellular concentration of different drugs including docetaxel, lowering its effect. The most studied of these proteins is the ATP-binding cassette subfamily B member 1 (ABCB1/MDR1) transporter, which is weakly expressed in normal prostate tissue but increases in expression with tumor progression. Other proteins of this family could also contribute to drug resistance in prostate cancer such as the multidrug resistance-associated protein 1 (ABCC1/MRP1), which is even more commonly expressed in prostate cancer tissue than MDR1, and the breast cancer resistance protein (ABCG2/BCRP). Additional mechanisms of resistance to docetaxel include the upregulation of the class III β-tubulin isoform, which has been involved with docetaxel resistance in prostate cancer and suppression of apoptosis through, for example, dysregulation of anti-/proapoptotic proteins such as B-cell lymphoma 2 (Bcl2) and B-cell lymphoma-extra large (Bcl-xL). In the last years, several reports have highlighted the participation of the EMT program (which has commonly been linked to the development of metastasis) in the induction of drug resistance in cancer cells., Cells undergoing epithelial–mesenchymal transition (EMT) are characterized by a loss of cell-to-cell adhesions and increased migratory and invasive capacities. It has been described that chemoresistant cells generally have a phenotype that resembles this., The group of Kajiyama et al.showed that paclitaxel-resistant ovarian cancer cells had phenotype changes consistent with the EMT process, with lower E-cadherin expression and higher levels of vimentin and fibronectin. Moreover, Shah et al. reported that pancreatic cancer cells with induced resistance to gemcitabine had a spindle-shaped morphology and were more migratory and invasive, a phenotype commonly associated with the EMT program. Recent works have pointed to the zinc finger E-box-binding homeobox 1 (ZEB1) transcription factor, which acts as one of the master regulators of EMT, as a link between this program and drug resistance in several types of cancer. Inhibition of ZEB1 expression in docetaxel-resistant breast cancer cell lines resensitized them to drug treatments. Furthermore, ZEB1 expression was described as a key factor in the establishment of a docetaxel-resistant phenotype in prostate cancer cells. Even though a relation has been established, the different mechanisms by which ZEB1 could induce chemoresistance in prostate cancer are still not clear. Previously, we showed that ZEB1 expression can modulate and induce the EMT program in prostate cancer cell lines; therefore, in our current work, we analyzed whether this transcription factor also promoted docetaxel resistance in prostate cancer cell lines and the possible mechanisms of this action. The human prostate carcinoma cell lines 22Rv1 and DU145 were obtained from the American Type Culture Collection (Cat. No. CRL-2505 and HTB-81, Rockville, MD, USA, respectively) and cultured in Roswell Park Memorial Institute medium (RPMI 1640; Thermo Fisher Scientific, Waltham, MA, USA) supplemented with 10% fetal bovine serum (HyClone, GE Life Sciences, Chicago, IL, USA) and 1% penicillin and streptomycin (Sigma-Aldrich, St. Louis, MO, USA). All cell lines were maintained under standard cell culture conditions at 37°C in 5% CO2 in a humid environment. 5.5 × 104 22Rv1 or DU145 cells were seeded on 6-well plates for 24 h before infection. Then, the cells were transduced with the corresponding overexpression or silencing lentiviral vectors at a multiplicity of infection of 5 in the presence of 8 μg ml−1 polybrene (Sigma-Aldrich) for 24 h. The stable expression of the vectors was determined by selection for 48 h with 1.5 μg ml−1 of puromycin (Sigma-Aldrich). Afterward, to assess the efficacy of the lentiviral transduction, mRNA and protein levels of ZEB1 were measured using quantitative reverse transcriptase polymerase chain reaction (qRT-PCR) and western blot, respectively. For ZEB1 overexpression, the pLenti-suCMV(ZEB1)-Rsv(RFP-Puro) vector was used with the pLenti-suCMV-Rsv(RFP-Puro) as control. For ZEB1 silencing, the pLenti-U6-shRNA(h ZEB1)-Rsv(RFP-Puro) vector was used with pLenti-U6-shRNA(neg-control)-Rsv(RFP-Puro) as control. All lentiviruses used in this work were purchased from Gen Target Inc., (San Diego, CA, USA). Western blot assays were carried out as previously described in our laboratory. Briefly, the cells were grown to confluence and then proteins were extracted using radioimmunoprecipitation assay (RIPA) buffer and quantified by the Bradford method. For the analysis, 50 μg of protein was resolved over 10% polyacrylamide gels and electrotransferred onto a nitrocellulose membrane. The membranes were blocked with a blocking buffer for 1 h at room temperature and then were incubated overnight at 4°C with the corresponding primary antibody in blocking buffer, followed by incubation with the appropriate secondary antibody for 1 h and detected by chemiluminescence. Bands were quantified using the IMAGE-J photo analysis program (US National Institutes of Health, Bethesda, ML, USA). The following primary antibodies were used: MDR1 (Cat. No. WH0005243M1, Sigma-Aldrich), MRP1 (Cat. 14685S, Cell Signaling, Danvers, MA, USA), BCRP (Cat. No. 4477S, Cell Signaling), MRP4 (Cat. No. Ab15602, Abcam, Cambridge, UK,), MRP7 (Cat. No. Ab91451, Abcam), active caspase 3 (Cat. No. 9661S, Cell Signaling), Bcl2 (Cat. No. 13-8800, Thermo Fisher Scientific), BCL2-associated X protein (Bax) (Cat. No. MA5-143994, Thermo Fisher Scientific), and β-actin as loading control (Cat. No. 69100, MP Bio, Santa Ana, CA, USA). 1.5 × 104 cells of each studied type were seeded in 48-well plates and maintained under standard cell culture conditions (37°C and 5% CO2). After 24 h, the cells were treated with various concentrations of docetaxel for 48 h, after which cell viability was assessed using the 3- [4,5-dimethylthiazol-2-yl]-2,5-diphenyl tetrazolium bromide (MTT) assay. Briefly, 100 μl of MTT reagent (5 mg ml−1 in PBS) (Cat. No. M6494, Thermo Fisher Scientific) was added to each well, and the microplates were then incubated for 2.5 h at 37°C in the dark. The MTT solution was then removed from the wells by aspiration and the crystals were dissolved in dimethyl sulfoxide (DMSO; 250 μl). Absorbance was measured on a Synergy HT Multi-Mode Microplate Reader (Biotek Instruments, Winooski, VT, USA) at 550 nm wavelength. The effect of docetaxel on cell viability was assessed as the percentage of viable cells after treatment where untreated cells were taken as 100% viable. The cells were seeded and treated as described above. After 48 h of treatment, the cells were detached using trypsin-EDTA (Thermo Fisher Scientific) and centrifuged at 160g for 5 min. The supernatant was discarded, and the cell pellet was resuspended in 1 ml of serum-free complete medium. Next, 10 μl of 0.4% trypan blue (Sigma-Aldrich) and 10 μl of cell suspension were mixed and incubated 3 min at room temperature and then a drop of the mixture was applied to a hemocytometer (Sigma-Aldrich), and viable (unstained) and nonviable (stained) cells were counted for each of the four quadrants and the mean multiplied by 20 000 to obtain the number of cells per ml of cell suspension. To establish the role of the MRP family of transporters in ZEB1-mediated resistance to docetaxel, the cells were incubated first with 100 μm l−1 MK571 (Cat. No. M7571-5MG; Sigma-Aldrich) for 1 h before docetaxel treatment. The cells were then treated normally with different concentrations of docetaxel, and the viability was expressed as described above. 1 × 106 cells were seeded in 100-mm plates and after 24 h treated with 10 nmol l−1 docetaxel for 12 h and 24 h. After the treatment, the cells were trypsinized, washed with cold PBS, and centrifuged at 700g for 5 min. The supernatant was discarded, and the pellet was resuspended in 1 ml of cold PBS. The cells were counted with a Neubauer chamber, and 1 × 105 cells were transferred to a cytometry tube. Then, the cells were processed and labeled according to the BD Pharmingen Annexin V-FITC Apoptosis Detection Kit instructions (Cat. No. 556547, Becton Dickinson, Franklin Lakes, NJ, USA). Finally, labeled cells were analyzed using a FACScan cytometer (Becton Dickinson), and the analysis of the results was made using the FCS Express Plus software (DeNovo Software, Glendale, CA, USA). The triple analysis was conducted using the ApoTox-Glo Triplex assay (Cat. No. G6320, Promega, Madison, WI, USA) according to the manufacturer's instructions. Briefly, 1 × 104 cells were seeded in a 96-well plate and after 24 h treated with different concentrations of docetaxel for 48 h. Following treatment, the medium was removed and the cells were incubated with a viability/cytotoxicity reagent for 30 min, after which fluorescence was read at 400Ex/505Em (for viability; Ex: excitation, Em: emission) and 485Ex/520Em (for cytotoxicity) using a Synergy HT Multi-Mode Microplate Reader (Biotek Instruments). After this, the apoptosis detection reagent was added (Caspase-Glo®3/7), and the cells were incubated for 30 min at room temperature. Afterward, luminescence was read using the same microplate reader mentioned above. The data were expressed as mean ± standard deviation (s.d.). All experiments were repeated at least three times. The significance between the control (or wild type) and transduced cells was calculated using an unpaired Student's t-test for P value. P < 0.05 was considered statistically significant. The GraphPad prism 6.0 program was used (GraphPad Software, Inc., San Diego, CA, USA) for all the statistical analyses. All procedures were approved by the Bioethics Committee for Research on Human Beings and the Risk Prevention and Biosafety Unit of the Faculty of Medicine of the University of Chile (Independencia, Santiago, Chile). Using lentiviral transduction, we obtained cell lines with stable overexpression (22Rv1-ZEB1) and silencing (DU145-shZEB1) of ZEB1 and their respective control (22Rv1-ctrl and DU145-scr). In a previous work, we characterized different prostate cancer cell lines in terms of their ZEB1 expression and general EMT-related gene expression and migratory/invasive properties. 22Rv1 cells were chosen as a model to study the effects of ZEB1 overexpression due to their low ZEB1 and vimentin levels and high E-cadherin expression (a more epithelial-like phenotype). On the other hand, DU145 cells had high levels of ZEB1 and vimentin and low levels of E-cadherin (a more mesenchymal-like phenotype), making it a good model to study the effects of ZEB1 silencing. Moreover, overexpression of ZEB1 induced a switch in E-cadherin/vimentin levels and conferred to 22Rv1 cells higher migration and invasive capacities. ZEB1 silencing induced the opposite switch in E-cadherin/vimentin expression making DU145 cells less migratory and invasive, suggesting EMT-like changes in these cell lines with ZEB1 modulation. ZEB1 silencing and overexpression in DU145 and 22Rv1 cells, respectively, was confirmed by western blot analysis as shown in [Figure 1]a and [Figure 1]b. To analyze the possible effect of ZEB1 expression on drug resistance, we treated the transduced cell lines with different concentrations of docetaxel for 48 h, after which the drug was removed and cell viability was evaluated using the MTT method. The results in [Figure 1]c show that all cells exhibited a dose-dependent response to drug treatment and that 22Rv1 cells with ZEB1 overexpression were more resistant to docetaxel treatment, while DU145 cells with ZEB1 silencing were more sensitive to the drug (both compared to their respective control and to the wild-type cell line, P < 0.01 in all cases). Moreover, using a linear regression, IC50 values for drug sensitivity were obtained for all cultures. The IC50 for 22Rv1-ZEB1 cells was about twice the concentration of the IC50 of the 22Rv1-ctrl cells, with DU145-shZEB1 cells showing reduced values to about half of those seen in DU145-scr cells [Figure 1]d. In addition, as it has been reported that some chemotherapeutic drugs can affect MTT results, we used the trypan blue exclusion method to confirm the effects of docetaxel on cell viability. The results for the viability analysis using trypan blue were similar to the MTT results, validating the use of MTT to analyze cell viability in our model [Figure 1]e. Furthermore, in our previous work, it was shown that changes in ZEB1 expression had no significant effect on proliferation of any of the cells in our model, discarding the possibility that the differential effects of docetaxel on cell viability could have been influenced by differences in the proliferation rate of the cells. These results indicate that ZEB1 expression can confer to 22Rv1 and DU145 cells a higher resistance to treatment with docetaxel. Figure 1: Effect of ZEB1 expression on docetaxel sensitivity of prostate cancer cell lines. (a) Western blot analysis for the stable overexpression and silencing of ZEB1 in cell lines 22Rv1 and DU145, respectively. (b) Quantification of the western blot results in a. (c) Changes in viability of 22Rv1 cells with ZEB1 overexpression and DU145 cells with ZEB1 silencing compared to control and wild-type cells following treatment with different concentrations of docetaxel. The ratio of viability was obtained using MTT with untreated WT cells as 100% of viability. (d) Graphs showing the IC50 values of the experiments in c. (e) Viability assay using the trypan blue exclusion method for 22Rv1 cells with ZEB1 overexpression and DU145 cells with ZEB1 silencing following treatment with different concentrations of docetaxel. Each image shows a representative experiment repeated three times with similar results (n = 3). *P < 0.05 in all cases (22Rv1-ZEB1 vs 22Rv1-ctrl/22Rv1-WT or DU145-shZEB1 vs DU145-scr/DU145–WT). IC50: half maximal inhibitory concentration; ZEB1: zinc finger E-box-binding homeobox 1; WT: wild type cells; MTT: 3-[4,5-dimethylthiazol-2-yl]-2,5-diphenyl tetrazolium bromide; scr: cells transduced with a random shRNA with no known targets; ctrl: cells transduced with an empty lentiviral vector used as control; shZEB1: cells transduced with a lentiviral vector containing a shRNA against ZEB1. To have a better understanding of how ZEB1 could exert its protective role in our cell model, the protein expression of MDR1, MRP1, BCRP, MRP4, and MRP7 (known chemoresistance markers) was studied. Western blot analysis was performed to investigate whether a differential expression of these proteins could be responsible for the differences in docetaxel sensitivity observed in [Figure 1]. First, we determined the basal levels of expression for the proposed markers in all the generated sublines. 22Rv1 cells with ZEB1 overexpression displayed a significant increase in MRP1 and MRP4 ([Figure 2]a and [Figure 2]b, P < 0.01 and P = 0.0129, respectively) expression with no changes in BCRP or MRP7 ([Figure 2]a and [Figure 2]b, P = 0.114 and P = 0.22, respectively) when compared to their control. 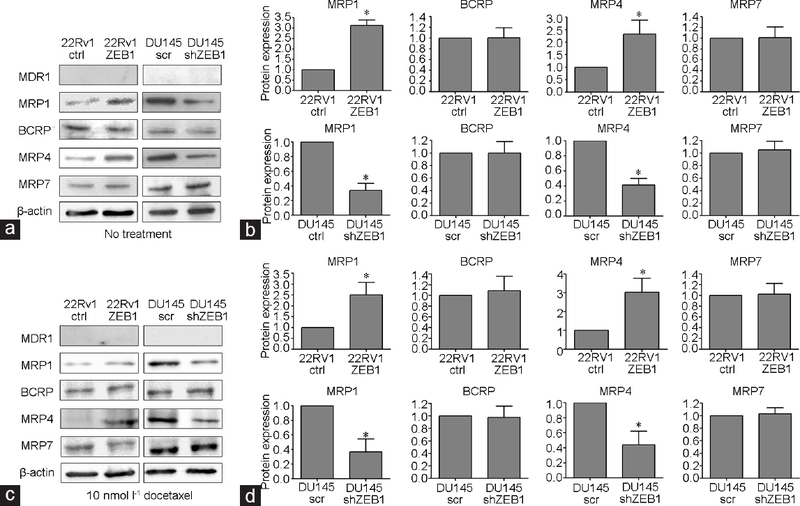 In contrast, ZEB1 silencing in DU145 cells caused a downregulation of MRP1 and MRP4 expression ([Figure 2]a and [Figure 2]b, P < 0.01 for both markers) while no changes were observed in BCRP and MRP7 when compared with their respective control ([Figure 2]a and [Figure 2]b, P = 0.1528 and P = 0.132, respectively). To investigate whether docetaxel treatment could exert an effect on the expression of these proteins, we exposed all the different cell lines to docetaxel for 48 h (7.5 nmol l−1 for 22Rv1-ZEB1 and 22Rv1-ctrl cells and 10 nmol l−1 for DU145-shZEB1 and DU145-scr cells), and the protein expression was analyzed. 22Rv1-ZEB1 cells displayed higher protein levels of MRP1 and MRP4 ([Figure 2]c and [Figure 2]d, P < 0.01 for both markers) with no variation in BCRP or MRP7 level ([Figure 2]c and [Figure 2]d, P = 0.227 and P = 0.199, respectively) when compared to their respective control, while on the other hand, DU145-sh cells presented lower MRP1 and MRP7 expression ([Figure 2]c and [Figure 2]d, P < 0.01 for both markers) and no difference in BCRP or MRP7 when compared to their respective control ([Figure 2]c and [Figure 2]d, P = 0.144 and P = 0.219, respectively). Nevertheless, the expression levels for all the analyzed markers were not significantly different between treated and nontreated cells (P > 0.05 in all cases). Interestingly, we found no protein expression of MDR1 in the studied cultures [Figure 2]a and [Figure 2]c. These results suggest that the changes in sensitivity to docetaxel observed in our models with ZEB1 modulation could be in part attributed to changes in the expression of members of the ATP-binding cassette (ABC) family of transporters. Figure 2: Effect of ZEB1 on the expression of chemoresistance markers in prostate cancer cell lines. (a) Western blot analysis of various chemoresistance markers in 22Rv1 cells with ZEB1 overexpression and DU145 cells with ZEB1 silencing before docetaxel treatment. (b) Quantification of the western blot results in a. (c) Western blot analysis of chemoresistance markers in 22Rv1 cells overexpressing ZEB1 and DU145 with ZEB1 silencing after 48 h of treatment with docetaxel. (d) Quantification of the western blot results in c. Each image shows a representative experiment repeated three times with similar results (n = 3). *P < 0.05 in all cases (22Rv1-ZEB1 vs 22Rv1-ctrl or DU145-shZEB1 vs DU145-scr). ZEB1: zinc finger E-box-binding homeobox 1; scr: cells transduced with a random shRNA with no known targets; ctrl: cells transduced with an empty lentiviral vector used as control; shZEB1: cells transduced with a lentiviral vector containing a shRNA against ZEB1. Changes in the ratio between pro- and anti-apoptotic proteins in malignant cells have been reported as playing a crucial role in the development of chemoresistance. To analyze the possible involvement of the apoptotic pathway in ZEB1-mediated resistance to docetaxel, we used the annexin V-fluorescein isothiocyanate (FITC)/propidium iodide (PI) double staining method to quantify, by flow cytometry, the percentage of cells in early apoptosis after docetaxel treatment. Du145-shZEB1 and DU145-scr cells were treated with 10 nmol l−1 docetaxel for 12 h and 24 h and then subjected to flow cytometry for annexin V-FITC/PI detection. After 12 h of treatment, the percentage of cells in early apoptosis (defined as the number of FITC-positive/PI-negative cells) was significantly higher in the DU145-shZEB1 group when compared to the DU145-scr group ([Figure 3], P = 0.0301), and this difference increased when we analyzed the percentage of apoptotic cells after 24 h ([Figure 3], P < 0.01). In addition, the assay was extended to 48 h where the percentage of cells in early apoptosis was higher in DU145-shZEB1 cells than in the control group, but we also observed a significantly higher number of cells in late apoptosis/necrosis (FITC positive/PI positive), making it less helpful to quantify the effect of docetaxel treatment and ZEB1 modulation specifically on the apoptotic pathway (data not shown). Figure 3: Flow cytometry analysis of apoptosis by annexin V-FITC staining. (a) Assessment of apoptosis by flow cytometry in DU145 cells with ZEB1 silencing treated with docetaxel compared with nontreated cells. Cells in the lower right quadrant (green) were counted as cells in early apoptosis (FITC positive, PI negative). (b) Graphs showing the percentage of cells in early apoptosis in each of the conditions in a. Each image shows a representative experiment repeated three times with similar results (n = 3). *P < 0.05 in all cases (DU145-shZEB1 vs DU145-scr). ZEB1: zinc finger E-box-binding homeobox 1; FITC: fluorescein isothiocyanate; PI: propidium iodide; scr: cells transduced with a random shRNA with no known targets; shZEB1: cells transduced with a lentiviral vector containing a shRNA against ZEB1. Next, to confirm the annexin V results, the expression of key markers of apoptosis (Bcl2, Bax and active caspase 3) was measured in DU145-shZEB1 and control cells with or without docetaxel treatment. [Figure 4] shows that both DU145-shZEB1 and DU145-scr cells presented very low expression of apoptosis markers in the absence of external stimulus; however, this changed after 24 h of docetaxel treatment as shown in [Figure 4] where both cultures showed higher expression of all markers than untreated cells. Du145-shZEB1 cells had higher expression of the anti-apoptotic protein Bax and of active caspase 3 ([Figure 4], P < 0.01) and showed lower expression of the anti-apoptotic protein Bcl2 ([Figure 4], P = 0.0207), all compared to the levels observed in DU145-scr cells. Figure 4: Effect of ZEB1 silencing on the expression of apoptosis markers in DU145 cells. (a) Apoptosis markers were analyzed in DU145 cells with ZEB1 silencing before and after docetaxel treatment using western blot. (b) Quantification of the western blot results from treated cells in a. Each image shows a representative experiment repeated three times with similar results (n = 3). *P < 0.05 in all cases (DU145-shZEB1 vs DU145-scr). ZEB1: zinc finger E-box-binding homeobox 1; scr: cells transduced with a random shRNA with no known targets; shZEB1: cells transduced with a lentiviral vector containing a shRNA against ZEB1; Bax: BCL2-associated X protein; Bcl2: B-cell lymphoma 2. In addition, to confirm that the cytotoxic effect induced by docetaxel is due to the activation of the apoptosis program, and that this process is being affected by the modulation of ZEB1 expression, viability, cytotoxicity, and activation of caspases 3/7 (a hallmark of apoptosis activation) were assessed in a triple assay using DU145 cells with ZEB1 silencing. [Figure 5]a shows that there was a concentration-dependent decrease in viability with docetaxel treatment in DU145-scr cells and an increase in cytotoxicity and activation of caspases 3/7. These results are concordant with the activation of the apoptosis program as main cause of cell death at the concentrations and times studied in this assay. When analyzed, Du145-shZEB1 cells showed a higher sensitivity to docetaxel evidenced by a decrease in viability and increase in cytotoxicity and caspase 3/7 at lower concentrations of docetaxel ([Figure 5]b, P < 0.01). These results suggest that modulation of ZEB1 expression could promote a misbalance in anti-/proapoptotic proteins as an additional mechanism of docetaxel resistance; notwithstanding, the results cannot discard the possibility that the changes observed in the apoptotic pathway could be attributed to the altered expression of efflux pumps. Figure 5: Analysis of viability, cytotoxicity, and apoptosis. (a) Triple analyses of viability, cytotoxicity, and apoptosis in DU145 cells with ZEB1 silencing after treatment with different concentrations of docetaxel. (b) Graph showing the IC50 values of the experiments in a. Each image shows a representative experiment repeated three times with similar results (n = 3). *P < 0.05 in all cases (DU145-shZEB1 vs DU145-scr). ZEB1: zinc finger E-box-binding homeobox 1; AUF: arbitrary units of fluorescence; AUL: arbitrary units of luminescence; IC50: half maximal inhibitory concentration; scr: cells transduced with a random shRNA with no known targets; shZEB1: cells transduced with a lentiviral vector containing a shRNA against ZEB1. Changes in the expression of efflux pumps can affect intracellular concentration of anticancer drugs, limiting its cytotoxic effect and therefore the apoptotic response of cells. Given this fact, we decided to analyze the contribution of MRP4 (since MRP1 has been reported as a poor taxane transporter) to drug resistance in our model to understand whether the changes in apoptosis observed with ZEB1 modulation could be attributed to ZEB1 or were a consequence of the different expression of MRP4. In order to investigate this, we used MK571, a potent inhibitor for MRP4-mediated transport. 22Rv1-ZEB1 cells and its control were incubated with 100 μmo l−1 MK571 before treatment with different concentrations of docetaxel for 48 h. MRP4 blockage resulted in a resensitization of 22Rv1-ZEB1 cells to docetaxel treatment to levels similar to those of control cells ([Figure 6]a, P = 0.166), suggesting that this protein could be the main contributor to the differences in docetaxel resistance observed in our model. In addition, pretreatment incubation of 22Rv1-ctrl cells with MK571 had no effect on docetaxel resistance in these cells ([Figure 6]a, P = 0.5), suggesting that basal levels of MRP4 in 22Rv1 cells are not enough to mediate significant resistance to docetaxel. Moreover, [Figure 6]b shows that IC50 levels in 22Rv1-ZEB1 cells with MK571 pretreatment were similar to those of the control (P = 0.178). These results suggest that differential expression of MRP4 would be responsible for the variations in sensitivity to docetaxel observed in our models and that these changes in sensitivity would be characterized by modifications in the apoptotic response of these cells when treated with docetaxel, therefore making of MRP4 a possible therapeutic target to counter EMT-related docetaxel resistance. Figure 6: Blockage of MRP4 and its effect over docetaxel sensitivity in prostate cancer cells with ZEB1 overexpression. (a) Effect of ABCC4 blockage on the sensitivity of 22Rv1 cells with ZEB1 overexpression treated with docetaxel compared to control cells. (b) Graphs showing the IC50 values of the experiments in a. Each image shows a representative experiment repeated three times with similar results (n = 3). *P < 0.05 in all cases (22Rv1-ctrl/22Rv1-ctrl+MK571/22Rv1-ZEB1+MK571 vs 22Rv1-ZEB1). MK571: inhibitor for MRP4-mediated transport; ZEB1: zinc finger E-box-binding homeobox 1; ctrl: cells transduced with an empty lentiviral vector used as control; IC50: half maximal inhibitory concentration. Unlike most solid tumors, chemotherapy was not commonly used in prostate cancer treatment, except as palliative care at the metastatic stage. However, this changed over a decade ago with the approval of docetaxel as treatment for men with CRPC. Notwithstanding the initial results, all patients will develop, in time, resistance to the treatment. In the last years, the EMT program has been identified as a key step toward advanced stages of prostate cancer, including the resistance to chemotherapy., A recent work showed that ZEB1 was overexpressed in docetaxel-resistant prostate cancer cell lines, which was accompanied by other changes associated to EMT; nevertheless, mechanisms for ZEB1-mediated resistance were not proposed and are still unclear. In this study, we report that changes in ZEB1 expression were associated with resistance to docetaxel treatment in the prostate cancer cell lines DU145 and 22Rv1 and with changes associated to the EMT program, as seen in a previous work. Furthermore, recent evidence points out the involvement of ZEB1 in the development of chemoresistance in various types of cancer but without clear mechanisms being described. Zhang et al. recently proposed that this transcription factor might not have a unique mechanism for inducing chemoresistance and that these potential mechanisms could be dependent on the type of cancer being studied. The transport of docetaxel into the cell is highly regulated by transporters of the ABC family. The most known is MDR1, which has been strongly correlated with resistance to docetaxel treatment in various types of cancer, including prostate., In our current work, we found no expression of MDR1 in our cell lines; nevertheless, expression of other transporters such as BCRP and MRP1 was observed, with the latter showing expression levels that correlated with ZEB1 expression. Because MRP1 is a poor docetaxel transporter, we also analyzed the expression of other members of this family that have been related to docetaxel resistance. In our present work, we found that MRP4 levels increased after ZEB1 overexpression in 22Rv1 cells and decreased its expression with ZEB1 silencing in DU145 cells. This transporter has been associated with resistance to multiple chemotherapeutics including docetaxel resistance in prostate cancer. Importantly, a work by Sullivan et al. found no expression of MDR1 in prostate cancer samples at any level of malignancy. In concordance with this, Demidenko et al.reported that MDR1 expression on prostate cancer samples was significantly downregulated compared to normal prostate and that, interestingly, MRP4 was upregulated in the prostate cancer group of samples. Thus, other transporters such as MRP4 could account for many cases of failed chemotherapy in prostate cancer cases where MDR1 is not present. In a recent study, Li et al. observed that, by targeting MRP4, they were able to reverse docetaxel resistance in a CRPC model. 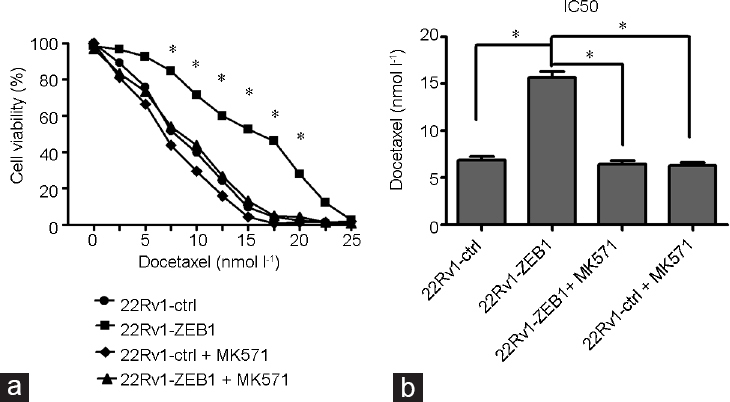 Importantly and in concordance with these data, in this work, we showed that blockage of MRP4 using MK571 completely restored sensitivity to docetaxel in 22Rv1 cells with ZEB1 overexpression, adding evidence that points to upregulation of this transporter as a novel and not yet described mechanism of ZEB1-mediated docetaxel resistance. Moreover, chemoresistance in CRPC has been described as mostly multifactorial and following this line. O'Neill et al. characterized several prostate cancer cell lines where docetaxel resistance was induced and found that these cell lines presented different resistance mechanisms. Because the most common mechanism of cell death triggered by docetaxel is apoptosis, several reports have related changes in the control of apoptosis with resistance to this drug.,, Consistent with this, in addition to the changes in drug transporter expression, we found that the decrease in ZEB1 expression made DU145 cells more sensitive to death by apoptosis in response to docetaxel. Several reports have shown that changes in key anti-/proapoptotic proteins decrease cellular response to chemotherapy. Ferlini et al. reported that downregulation of Bcl2 led to paclitaxel resistance (the drug from which docetaxel was derived), while Lebedeva et al. showed that overexpression of Bcl-xL conferred to PC3 cell resistance to various drugs. In addition, Raffo et al. described that nearly 100% of samples from patients with CRPC had high expression of Bcl2. In concordance with this, we found that the silencing of ZEB1 in DU145 cells leads to lower levels of Bcl2 and higher levels of Bax and active caspase 3 when compared to its control, thus presenting a higher rate of cell death by apoptosis after docetaxel treatment. This evidence supports the idea that an imbalance of anti-/proapoptotic proteins could contribute to drug resistance. Although other mechanisms of cell death have been described for docetaxel treatment, our results suggest that apoptosis would be the main one in our model. Morse et al.reported that docetaxel treatment could induce death through mitotic catastrophe in breast cancer cell lines. However, Hernández-Vargas et al. demonstrated, also in breast cancer cell lines, that the type of death induced by docetaxel could be related to the drug concentration and time of exposure. In our study, using prostate cancer cell lines with ZEB1 modulation, we showed that docetaxel triggered cell death by apoptosis as the main cause and that this mechanism was altered in response to MRP4 expression. This pattern of cell death in response to docetaxel could be explained by the treatment scheme that was used or even due to the cellular model. One of the main problems in the management of prostate cancer in advanced stages is the appearance of multiple mechanisms of resistance to the commonly used treatments. Our data showed that ZEB1 expression can modulate MRP4 expression in prostate cancer cell lines conferring them resistance to docetaxel which was characterized by a misbalance in pro/anti apoptotic proteins. The results contribute to a better understanding of some of the underlying mechanisms that might mediate ZEB1-related chemoresistance. OOS designed the project, carried out the molecular studies, performed the statistical analysis, and drafted the manuscript. DH carried out the molecular studies. EAC participated in the drafting, revision, and discussion of the manuscript, and HRC participated in the design and coordination of the project and helped with the drafting, revision, and discussion of the manuscript. All authors read and approved the final manuscript. The authors would like to thank Ms. Graciela Caroca for her technical assistance. The present study was supported by grants from the National Fund for Scientific and Technological Development, Chile (FONDECYT); FONDECYT No. 1151214 (HRC), FONDECYT No. 1140417 (EAC). OOS carried out his PhD. studies thanks to a scholarship from the National Commission for Scientific and Technological Research (CONICYT scholarship No. 21140772). Denmeade SR, Isaacs JT. A history of prostate cancer treatment. Nat Rev Cancer 2014; 2: 389–96. Steele CB, Li J, Huang B, Weir HK. Prostate cancer survival in the United States by race and stage (2001-2009): findings from the CONCORD-2 study. Cancer 2017; 123 (Suppl 24): 5160–77. Litwin MS, Tan HJ. The diagnosis and treatment of prostate cancer: a review. JAMA 2017: 317: 2532–42. Petrylak DP, Tangen CM, Hussain MH, Lara PN Jr, Jones JA, et al. Docetaxel and estramustine compared with mitoxantrone and prednisone for advanced refractory prostate cancer. N Engl J Med 2004; 351: 1513–20. Hwang C. Overcoming docetaxel resistance in prostate cancer: a perspective review. Ther Adv Med Oncol 2012; 4: 329–40. McGrogan BT, Gilmartin B, Carney DN, McCann A. Taxanes, microtubules and chemoresistant breast cancer. Biochim Biophys Acta 2008; 1785: 96–132. Seruga B, Ocana A, Tannock IF. Drug resistance in metastatic castration-resistant prostate cancer. Nat Rev Clin Oncol 2011; 8: 12–23. Kawai K, Sakurai M, Sakai T, Misaki M, Kusano I, et al. Demonstration of MDR1 P-glycoprotein isoform expression in benign and malignant human prostate cells by isoform-specific monoclonal antibodies. Cancer Lett 2000; 150: 147–53. Bhangal G, Halford S, Wang J, Roylance R, Shah R, et al. Expression of the multidrug resistance gene in human prostate cancer. Urol Oncol 2000; 5: 118–21. David-Beabes GL, Overman MJ, Petrofski JA, Campbell PA, de Marzo AM, et al. Doxorubicin-resistant variants of human prostate cancer cell lines DU 145, PC-3, PPC-1, and TSU-PR1: characterization of biochemical determinants of antineoplastic drug sensitivity. Int J Oncol 2000; 17: 1077–86. Ozben T. Mechanisms and strategies to overcome multiple drug resistance in cancer. FEBS Lett 2006; 580: 2903–9. Ploussard G, Terry S, Maillé P, Allory Y, Sirab N, et al. Class III β-tubulin expression predicts prostate tumor aggressiveness and patient response to docetaxel-based chemotherapy. Cancer Res 2010; 70: 9253–64. Karnak D, Xu L. Chemosensitization of prostate cancer by modulating Bcl-2 family proteins. Curr Drug Targets 2010; 11: 699–707. Kalluri R, Weinberg RA. Review series the basics of epithelial-mesenchymal transition. J Clin Invest 2009; 119: 1420–8. McConkey DJ, Choi W, Marquis L, Martin F, Williams MB, et al. Role of epithelial-to-mesenchymal transition (EMT) in drug sensitivity and metastasis in bladder cancer. Cancer Metastasis Rev 2009; 28: 335–44. Huang J, Li H, Ren G. Epithelial-mesenchymal transition and drug resistance in breast cancer (Review). Int J Oncol 2015; 47: 840–8. Kajiyama H, Shibata K, Terauchi M, Yamashita M, Ino K, et al. Chemoresistance to paclitaxel induces epithelial-mesenchymal transition and enhances metastatic potential for epithelial ovarian carcinoma cells. Int J Oncol 2007; 31: 277–83. Shah AN, Summy JM, Zhang J, Park SI, Parikh NU, et al. Development and characterization of gemcitabine-resistant pancreatic tumor cells. Ann Surg Oncol 2007; 14: 3629–37. Caramel J, Ligier M, Puisieux A. Pleiotropic roles for ZEB1 in cancer. Cancer Res 2018; 78: 30–5. Wang H, Vo T, Hajar A, Li S, Chen X, et al. Multiple mechanisms underlying acquired resistance to taxanes in selected docetaxel-resistant MCF-7 breast cancer cells. BMC Cancer 2014; 14: 37. Hanrahan K, O'Neill A, Prencipe M, Bugler J, Murphy L, et al. The role of epithelial–mesenchymal transition drivers ZEB1 and ZEB2 in mediating docetaxel-resistant prostate cancer. Mol Oncol 2017; 11: 251–65. Du B, Shim JS. Targeting epithelial-mesenchymal transition (EMT) to overcome drug resistance in cancer. Molecules 2016; 21: 965. Orellana-Serradell O, Herrera D, Castellon EA, Contreras HR. The transcription factor ZEB1 promotes an aggressive phenotype in prostate cancer cell lines. Asian J Androl 2017; 19: 1–7. Ulukaya E, Colakogullari M, Wood EJ. Interference by anti-cancer chemotherapeutic agents in the MTT-tumor chemosensitivity assay. Chemotherapy 2004; 50: 43–50. Schultz S. Determining the Predictive Mechanism of Toxicity Using a Single-Well Multiplexed Assay. Promega Corporation; Updated 2009. Available from: http://www.worldwide.promega.com/resources/pubhub/determining-the-predictive-mechanism-of-toxicity-with-apotox-glo/. [Last accessed on 2018 Apr 04]. Xue X, Liang XJ. Overcoming drug efflux-based multidrug resistance in cancer with nanotechnology. Chin J Cancer 2012; 31: 100–9. Schinkel AH, Jonker JW. Mammalian drug efflux transporters of the ATP binding cassette (ABC) family: an overview. Adv Drug Deliv Rev 2003; 55: 3–29. Oprea-Lager DE, Bijnsdorp IV, Van Moorselaar RJ, Van Den Eertwegh AJ, Hoekstra OS, et al. 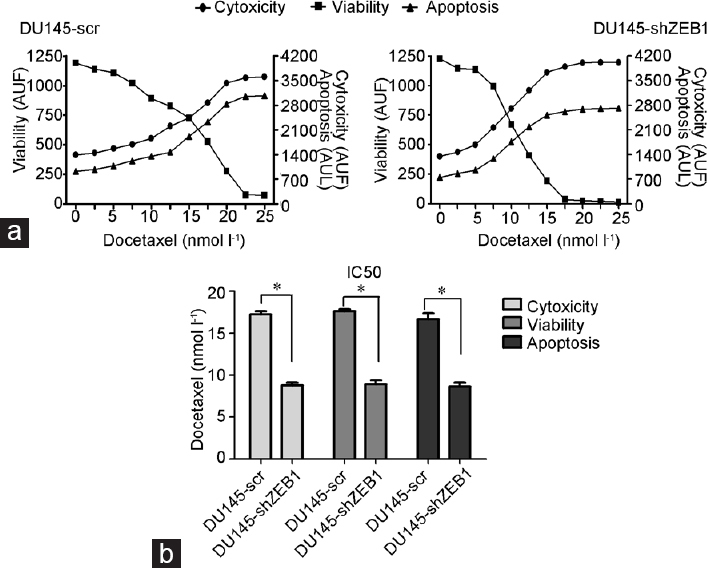 ABCC4 decreases docetaxel and not cabazitaxel efficacy in prostate cancer cells in vitro. Anticancer Res 2013; 33: 387–92. Tannock IF, Osoba D, Stockler MR, Ernst DS, Neville AJ, et al. Chemotherapy with mitoxantrone plus prednisone or prednisone alone for symptomatic hormone-resistant prostate cancer: a Canadian randomized trial with palliative end points. J Clin Oncol 1996; 14: 1756–64. Berthold DR, Pond GR, Soban F, de Wit R, Eisenberger M, et al. Docetaxel plus prednisone or mitoxantrone plus prednisone for advanced prostate cancer: updated survival in the TAX 327 study. J Clin Oncol 2008; 26: 242–5. Marín-Aguilera M, Codony-Servat J, Reig Ò, Lozano JJ, Fernández PL, et al. Epithelial-to-mesenchymal transition mediates docetaxel resistance and high risk of relapse in prostate cancer. Mol. Cancer Ther 2014; 13: 1270–84. Zhang P, Sun Y, Ma L. ZEB1: at the crossroads of epithelial-mesenchymal transition, metastasis and therapy resistance. Cell Cycle 2015; 14: 481–7. Greenberger LM, Sampath D. Resistance to taxanes. In: Teicher BA, editors. Cancer Drug Resistance. Cancer Drug Discovery and Development. Totowa: Humana Press;2006. p329–58. Katayama K, Noguchi K, Sugimoto Y. Regulations of P-glycoprotein/ABCB1/ MDR1 in human cancer cells. New J Sci 2014; 2014: 1–10. Li YF, Ji HH, Zhang ZL, Zhang TT, Gan W, et al. Targeting MRP4 expression by anti-androgen treatment reverses MRP4-mediated docetaxel resistance in castration-resistant prostate cancer. Oncol Lett 2017; 14: 1748–56. Sullivan GF, Amenta PS, Villanueva JD, Alvarez CJ, Yang JM, et al. The expression of drug resistance gene products during the progression of human prostate cancer. Clin Cancer Res 1998; 4: 1393–403. Demidenko R, Razanauskas D, Daniunaite K, Lazutka JR, Jankevicius F, et al. Frequent down-regulation of ABC transporter genes in prostate cancer. BMC Cancer 2015; 15: 683. Chandrasekar T, Yang JC, Gao AC, Evans CP. Targeting molecular resistance in castration-resistant prostate cancer. BMC Med 2015; 13: 206. O'Neill AJ, Prencipe M, Dowling C, Fan Y, Mulrane L, et al. Characterisation and manipulation of docetaxel resistant prostate cancer cell lines. Mol Cancer 2011; 10: 126. Ferlini C, Raspaglio G, Mozzetti S, Distefano M, Filippetti F, et al. Bcl-2 down-regulation is a novel mechanism of paclitaxel resistance. Mol Pharmacol 2003; 64: 51–8. Lebedeva I, Rando R, Ojwang J, Cossum P, Stein CA. Bcl-xL in prostate cancer cells: effects of overexpression and down-regulation on chemosensitivity. Cancer Res 2000; 60: 6052–60. Raffo AJ, Perlman H, Chen MW, Day ML, Streitman JS, et al. Overexpression of bcl-2 protects prostate cancer cells from apoptosis in vitro and confers resistance to androgen depletion in vivo. Cancer Res 1995;55: 4438–45. Mediavilla-Varela M, Pacheco FJ, Almaguel F, Perez J, Sahakian E, et al. Docetaxel-induced prostate cancer cell death involves concomitant activation of caspase and lysosomal pathways and is attenuated by LEDGF/p75. Mol Cancer 2009; 8: 68. Morse DL, Gray H, Payne CM, Gillies RJ. Docetaxel induces cell death through mitotic catastrophe in human breast cancer cells. Mol Cancer Ther 2005; 4: 1495–504. Hernández-Vargas H, Palacios J, Moreno-Bueno G. Molecular profiling of docetaxel cytotoxicity in breast cancer cells: uncoupling of aberrant mitosis and apoptosis. Oncogene 2007; 26: 2902–13. Antonarakis ES, Armstrong AJ. Evolving standards in the treatment of docetaxel-refractory castration-resistant prostate cancer. Prostate Cancer Prostatic Dis 2011; 14: 192–205.